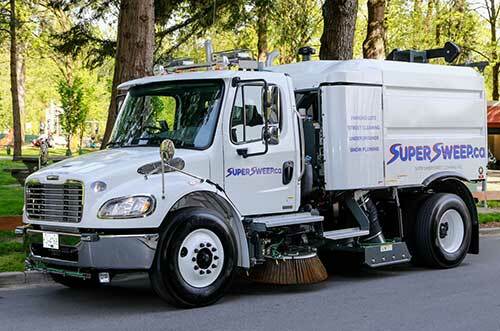 Super Sweep Street Cleaning, Inc. is a relatively new power-sweeping company that services the Greater Metro Vancouver, British Columbia (Canada) area. Andrew Hunter founded the so far very successful sweeping company in September of 2015 and, on this one-year anniversary of the company, we are choosing them to be our Featured Contractor. Our intent is to perhaps provide some insight to others looking to get into the sweeping business of how quickly success can happen, as well as the kinds of things that they might be helped by learning over the first few months and years they are in business. When he started Super Sweep, Hunter knew from experience what to expect from a well-run sweeping operation. That’s because, in prior work as a builder and renovator, he had used a number of sweeping companies to support his projects. His experience also indicated that the power sweeping companies currently in business in the Metro Vancouver area were seemingly getting busier and busier. Along with that their prices had been going up even though, in his opinion, he saw a need for improvement in how many operated. Super Sweep is very multifaceted for being a startup company. Hunter had an advantage not available to many startups, in that he had available resources that allowed him to start “large out of the box.” As a result, Super Sweep has already has gained the reputation of being able to handle any type of pavement cleaning task a prospect for services might need. The company entered the marketplace by getting equipment that allowed it to service several segments of the industry. 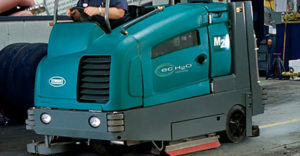 A Tennant scrubber enables them to handle that service in underground parking areas and warehouses; their Green Machine is designed for pathway and sidewalk sweeping; and, their Elgin Crosswinds give them the correct machine to do street and construction sweeping, as well as catch-basin cleaning. To get the company its initial customers, Hunter hit the ground and did a lot of door knocking. They also decided to become the Premier Sponsor of the “Construction Conference Build Ex” in Vancouver, and did many other forms of advertising as well as created a very strong Internet presence. Most successful so far, though, has been the door-knocking — trying to touch-connect with site supervisors in construction. That segment of sweeping has become their main business segment to date. “We’re doing a lot of residential and industrial warehouse complexes,” Hunter related, “as well as parking lots for hotels and other commercial properties. We haven’t had many malls as clients, yet, but we certainly try to reach out to them. We also were successful in bidding for a city contract for street cleaning. We were just awarded that contract and we are quite excited to get started working for it, especially during the fall leaf season. 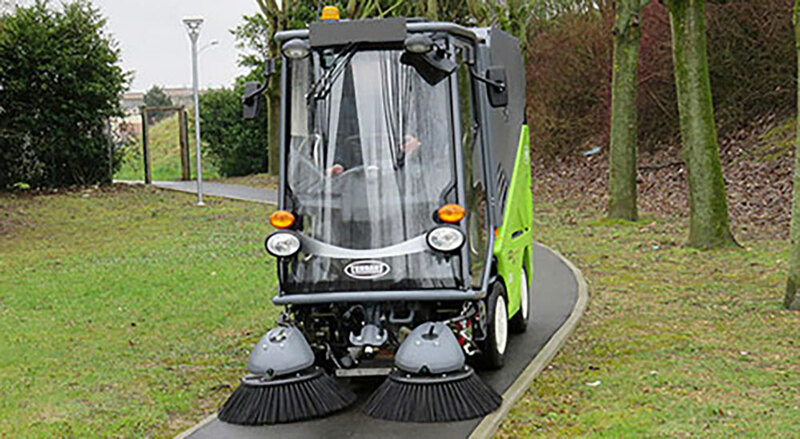 For street-class cleaning, Super Sweep uses Elgin Crosswind sweepers. One truck they bought from the City of Salt Lake that was quite new, with only 1,000 hoursand 10,000 miles on it. Even so, Hunter directed that many parts of it be repainted to look its best. “We’re all about the look of our sweepers — the professional look of them. We also keep them very clean. We even chrome-plated the front bumper on it so that cosmetically and mechanically it’s just like new. Their second Crosswind was just delivered, a brand-new 2016 model on a Freightliner M2 chassis. Since they had the luxury of specifying what they wanted, they decided to go for some options and add-ons that would make it a beautiful show machine. “We factory-ordered the chassis, which apparently is a somewhat rare thing to do, and we put on it every possible option that a sweeper owner could put on it. We specified an M2 chassis and it has “chrome everything,” along with powered windows and door locks, air-ride seats and the air-ride cab; according the people at Elgin, it’s very unusual that someone would order such a luxury chassis. Hunter related the extent to which the Elgin company was surprised to get that particular truck order. He says they were even told that it compared favorably to that company’s very famous NASCAR sweeper which, in terms of deluxe, can hardly be surpassed. That sweeper, which is shown above, Hunter says looks much better on the street and gets many comments from people who say they’ve never seen a sweeper like that before. Super Sweep does on-call construction sweeping with a 2-hour minimum, which is very competitive for the area since some area contractors insist on a 3- or 4-hour minimum. The company also just charges for one-way travel time, from the company’s base in Port Coquitlam to wherever the job site is located, but don’t charge for return travel time. The Crosswinds are outfitted with suction wander hoses, too, which allows the company to offer catch-basin cleaning and other jobs requiring that type of suction. Hunter decided early on to concentrate on the quality of the job they do instead of trying to get their work with the idea of always being the lowest price. He feels that’s a much better strategy for long-term success. He already realized that there’s no way to be successful if you are not charging enough so that you can keep your equipment well-maintained, keep experienced employees, and pay a fair wage such that you can attract quality people. “We quit chasing price very quickly,” said Hunter. “We realized that when you’re battling it out over price, nobody wins in the end. We’re in this business to make money and we’re not going to just get into this practice of undercutting until there’s no profits left. We focus on quality of the job; when we quote a job, we quote it to do the job right. Customers have learned that we never just go to a job site and do one pass and leave the area ‘good enough.’ We take several passes, sweeping until the result is perfect, which I’m fanatical about! I don’t like to see a single rock left on the road. If I even see one, I’ll turn around and I’ll do another pass. Typically, we’re doing 4 or 5 passes to get an area spotless. For those unfamiliar with Elgin’s pressure washer add-on, here’s how it works: The power washer takes water from the main water tank on the sweeper. The machine generates about 1,850 PSI so it can work quickly. Attached is a hose about 40 feet long which is mounted onto a spring-loaded reel in the back of the truck. This allows the operator to reach anywhere within 40 feet of the sweeper. By utilizing the straight spray tip, a user can get into the corners and blast everything out with the high pressure. That allows the sweeper to then make a pass and remove the detritus. It’s also handy as a way to wash out the hopper at the end of a shift, especially helpful if the sweeper isn’t going to be near a washout station before being parked. For driving the Crosswinds, which have air brakes, Canada has an equivalent to the United States’ Commercial Driver’s License (CDL), which is required at 26,000 GVW and above in the U.S. There are different levels of drivers’ licenses in British Columbia and each province in Canada has its own licensing requirement. In the Province of British Columbia, in order to operate a street sweeper with air brakes, the operator has to pass an air-brake test. This consists of either a 2-day course, which is all day for two consecutive days with a test on the third day, or the course may be taken over a week’s time. Unlike with a CDL, there is no drug testing requirement for the license or for other reasons, except for large companies. Highway, tractor, and commercial trucking companies require drug testing, according to Hunter, but that requirement is not one made by the government. Rather, it’s an individual company requirement that is standard practice for those types of firms. Super Sweep management does require all employees to go through a criminal-record background check, though, and their driving record is assessed and also monitored closely, which the British Columbia government does mandate. A requirement of the provincial government is that companies like Super Sweep must keep a copy of each driver’s driving history on file and then update it annually. The province also has quite strict requirements for commercial drivers; they must maintain a track record of following the rules of the road and adherence to good driving practices. When asked about safety, Hunter didn’t hesitate in his answer: “Safety is an ongoing thing. We discuss it daily. One of the other requirements of our government is that you have to keep a log on the sweeper. Every morning before every shift, the operator must record the vehicle’s mileage in that log. In addition, also required is a walkaround checks and a check-off of each section. So, before the vehicle moves on any given day the operator checks the vehicle’s signals, air brakes, lights and more. The fact all this has been done is entered into the log book and the operator then signs off on it. The log stays in the vehicle. Super Sweep may be contacted through the company’s website, www.Super Sweep.ca.